for the next Challenger Series and win up to € 1.200,- (without entry fee) ! Weekly international tournament series on Monday, Tuesday, Wednesday, Thursday and Friday. 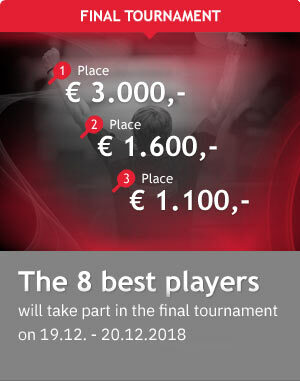 The 8 best players playing on the final tournament at the end of the year. The players have to play at least on 8 tournaments to take part in the final. Free Pick-up-service from Biberach railwaystation, Memmingen railwaystation or Memmingen Airport! Free board/catering for 2 days! Free board/catering for 3 days!